HomedigestThe case of the silent synapses: Why are only 20% of synapses active during neurotransmission? 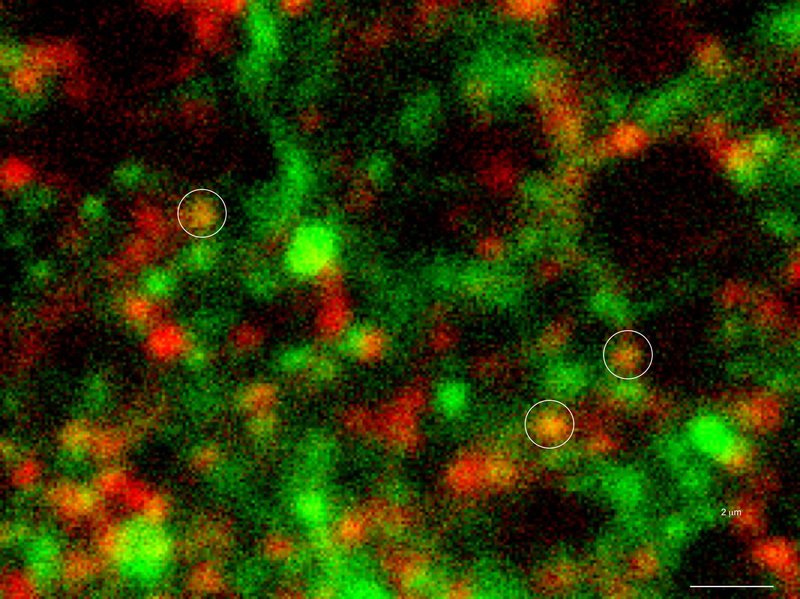 The case of the silent synapses: Why are only 20% of synapses active during neurotransmission? Unknown information coding in the brain? Columbia University scientists recently tested a new optical technique to study how information is transmitted in the brains of mice and made a surprising discovery: When stimulated electrically to release dopamine (a neurotransmitter or chemical released by neurons, or nerve cells, to send signals to other nerve cells), only about 20 percent of synapses — the connections between cells that control brain activity — were active at any given time. So Sulzer’s team turned to Dalibor Sames, PhD, associate professor of chemistry at Columbia, to develop a novel compound called “fluorescent false neurotransmitter 200″ (FFN200). When added to brain tissue or nerve cells from mice, FFN200 mimicked the brain’s natural neurotransmitters, allowing the researchers to spy on chemical messaging in action, focusing on complex tasks such as learning and memory. Silent synapses: unknown information coding? Using a fluorescence microscope, the researchers were able for the first time to view the release and re-uptake of dopamine — a neurotransmitter involved in motor learning, habit formation, and reward-seeking behavior — in individual synapses. When all the neurons were electrically stimulated in a sample of brain tissue, the researchers expected all the synapses to release dopamine. Instead, they found that less than 20 percent of dopaminergic synapses were active following a pulse of electricity. One possibility: these silent synapses hint at a mechanism of information coding in the brain that’s yet to be revealed, the researchers hypothesize. The study’s authors plan to pursue that hypothesis in future experiments and examine how other neurotransmitters behave. “If we can work this out, we may learn a lot more about how alterations in dopamine levels are involved in brain disorders such as Parkinson’s disease, addiction, and schizophrenia,” Sulzer said.